Many of the stocks I write about make the term 'sleepy' seem exciting. If only some of these oddball companies would become sleepy, it would be a step up. Even with companies that appear to be dormant it's helpful to look at them every few years to keep up with developments. I last wrote about Aztec Land and Cattle (AZLCZ) in 2012, and it's finally time for an update. If you're an investor dying to buy cheap real estate than Aztec Land and Cattle is a company you need to look at. When I first took a look at the company their 228,000 acres of land were effectively selling for $49 an acre. This is land they originally purchased for $.50 an acre in the 1860s. The company's land is mostly Arizona pasture land. In 2012 the company submitted a master development plan detailing to the county how they expected to slowly shift land usage from pure pasture to both commercial and residential uses. Since my last post on Aztec the stock has appreciated about 50%, which is significant for a company most investors expect to go nowhere for years. What prompted me to look at Aztec again is a new report by Andrew Slusser of Seven Pines Capital. Andrew initially emailed me his report, then we talked on the phone about the idea. What Andrew put together highlights how a small to medium amount of research on some of these oddball companies can give an investor an incredible informational advantage. Andrew highlighted a few aspects to Aztec Land and Cattle that I hadn't appreciated when I first evaluated the company. In the past two years the company has been very active. For the past few years the company has considered leasing out a portion of their land to a windmill farm. Two years ago this was just a concept, but today 14,000 acres are leased generating $140k in rent income. There are plans to increase the amount of land for additional wind power, although the timing for that is unknown. A bigger development in my mind is the purchase of the Catalyst Paper Company and Apache Railroad Company by Aztec. Both Catalyst Paper and the Apache Railroad fell into financial difficulties recently prompting bankruptcy filings. Aztec's Chairman led a group of investors that purchased a number of assets out of bankruptcy, including the railroad and 19,000 acres of land. Control of the railroad could serve as a catalyst for commercial development on Aztec's land. My suggestion on viewing the railroad is to view it not as a source of potential earnings, but as a reason for potential development. The company is marketing the commercial land by the railroad as the West Snowflake Railpark development. The area already has power, natural gas, road and railroad connections. Even with a wind farm and railroad commercial park the main thesis for Aztec rests on the value of their land. Their operations are essentially break-even and pay for the carry on their land holdings. Arizona is unique in that 16% of the state's land is deeded to private citizens and corporations. Arizona essentially has a 16% public float on their land. This is much less than surrounding states, and is partly the reason that pasture land averages $940 an acre in Arizona vs $360 an acre in New Mexico. The average price for pasture land in the US is $1,200 an acre. Also unique to Aztec is that their 228,000 acres are a single continuous segment, in a state little available land a single usable segment of contiguous land is significant. 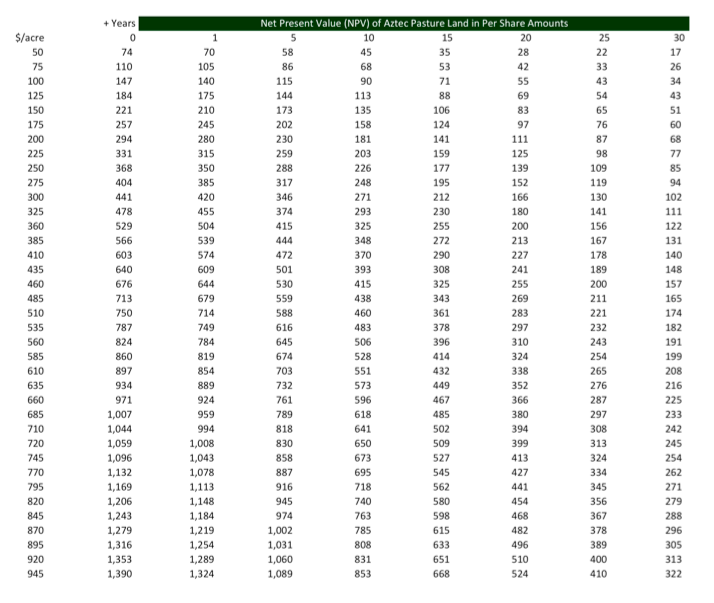 Pasture land in the US has steadily appreciated over the last decade. Sometimes a company gives investors insight into how they view their own assets. In the case of Aztec the company completed several inter-company transactions where land was swapped between subsidiaries. In these transactions the company valued their own acreage at $137 an acre, or double what the market values the company at. I think a very simple and compelling argument could be made that Aztec's land is worth more than the current market value of $77 an acre. The question I had when I first looked at the company was how long would investors need to wait for value to be realized? If the land is truly worth a few hundred dollars an acre, but an investor needs to wait 30 years for value to be realized this isn't a great return. A lot can happen in 30 years, and taking a gamble on something that far out is risky. Either the land needs to be worth significant more, or a change in value needs to happen relatively quickly, say in the next ten years or so. At current prices investors are saying the land is either worth little, or there is very little certainty as to when this thesis might play out. But an undervalued asset is undervalued regardless of whether it's land in Arizona or New York. Patience is not a skill that many investors have, which is probably why Aztec is trading for such a low valuation. If the company were to simply sell themselves as a ranch at today's New Mexico land prices they would receive $529/sh in proceeds. Let's consider that maybe it takes 20 years before the company decides to sell themselves as a ranch at today's prices, even still the shares would fetch $200, which is higher than the current share price. Granted no one ever knows what something is worth until it's sold, but there is a considerable margin of safety at these prices. With the current margin of safety investors also get the optionality of something good coming from the company's recent actions. Maybe the railroad will spur development, or maybe an additional wind farm will be built. We don't know, but even if this is 'just' a pasture and never progresses from being a pasture it should at least be priced like similar pastures throughout the state or country. My only qualm about the company is that they don't pay a dividend. When I invest in oddball stocks that are dark and my expected holding period is long I like to be paid something for waiting. Unfortunately shareholders of Aztec simply need to wait. If you're interested in Andrew's report drop me an email. I own a few shares of Aztec, however I realize that they need commercial development for the land to have greater value. One major problem is that the labor force is not large or skilled enough to support the industries that could bring jobs. So if's a bit of a chicken and egg problem. There's a long shot potash mine that would bring jobs, but I wouldn't bet the farm that it ever gets developed. you still own those shares? What's to stop an activist investor (besides someone with 50%+ ownership who refuses to play along) from buying the company and selling off the land. If it's the first time that huge of a block of land has come on the market in 150+ years, someone would likely jump on it. It's valued at $77 per acre from the market cap, but you could sell it for $250/acre(?) you'd make a ton of money. Maybe buy the company for $20m, sell the land for $57m and walk away with $37m? I feel like you've stumbled on something awesome, or I've missed something. It's more likely I've missed something. What do you think? Thanks for the update. Have held a 100 shares for a few years. I think water rights are a cheap option here with huge upside. A myriad of litigation makes it tough to value....but you are not paying much for this option. Aztec submitted a plan about 5 years ago; they have the potential to add over 51,000 homes on their land. Kind of pie in the sky imo (Navajo County had a population of only 112,000 in 2006 with a projected population of 200,000 by 2055). The complete Aztec area plan, as well as the county’s comprehensive plan and proposed amendments to the plan, are available online by visiting www.navajocountyaz.gov/pubworks/pz/ and clicking on the “comprehensive plan” link on the left-hand menu. No catalyst = value trap. Having no catalyst does not make it a value trap. Being in a secular declining industry is a value trap. Having no catalyst is no problem, if you have the patience to let the company do its work. Sooner or later the market will recognize the under valuation. The question then will be whether or not the investor is willing to sell. My take is if they are committed and see a potential, they'd either be buying shares themselves in the open market. And/or instigating a buyback to close that valuation gap. In respect of immediate value creation / Catalyst - if they sold off even 5% or the land at a fair market value say the $137 they are recording...the market will price in the remaining 95%. Quite interesting. Could you point me to where you and/or Seven Pines got information on the number of shares outstanding on Aztec? If you buy a share the company will email/mail you the annual report. The figure is in there. Thanks. Will they send the report after share purchase, or must one wait until the next annual report comes out? The primary reason that the market has priced Aztec's pasture land at such a low value (it's about $100/acre now) is that it's very poor pasture land. Comparing it to pasture land nationally, as though it were equivalent to pasture land in Iowa or Illinois, is misleading. I still agree that the company is cheap, and has some interesting attributes, and I own some shares, but the comparison of its pasture land to that in other states doesn't make sense. This company is a value trap. In your assertion that the land will be developed at some point, you have overlooked a fundamental issue in development--infrastructure. The cost to build water and sewer will be prohibitive to development. Further, the area is in a low-growth and low-income part of the state--myriad of other areas that will be developed first. Buyer pool for a ranch of this size is extremely small--the billionaires buying land in Texas will not touch this stuff as it is poor-quality grazing land relative to the pristine Texas ranches they buy. No buyer pool, no demand or ability to develop = no value.